Earlier this year, Mary Hudson Embry wrote about the cycle track addition on Gothersgade. Another "missing link" in the Inner City's bicycle network was just completed, this time on Bremerholm: a small one-way street near Christiansborg (the Parliament and other governmental functions building), Holmen Canal, and Magasin department store. The road leads towards other focal points in the Inner City such as the famous pedestrian street called Strøget. Now that Knippels Bridge is the most biked street in Copenhagen according to the newest 2012 Bicycle Accounts, the new cycle track will allow bicycle users to continue on a straight path from the bridge into the inner city. Before, one would have to risk going against the grain of car traffic or turn either left or right and take a more circuitous route. Other highlights: fresh bump-free pavement, a separate traffic light for bicycles, and two lanes-- one for those going straight or turning left and another to turn right. Before these additions- and admittedly sometimes during their construction process- the area was clogged as everyone and their uncle tried to squeeze past one another. A jumble of interweaving wheels and lots of glances over the shoulder. It's not like it was hellish before, but now it is a whole lot nicer. Many other cities have what is known as "contra-flow" bicycle lanes or cycle track that run in the opposite way of one-way traffic. These are common scenarios since almost all cities have one-way streets in one form or another regardless of whether they are in ancient city centres or along straight grid-systems. In the world of urban cycling, there are contra-lanes...and then there are contra-lanes. Like many aspects of perfecting bicycle infrastructure, one of the most important things is to make space for cyclists. Squeezing a skinny bike lane in a curving, roughly cobbled street with cars whizzing past at high speeds is not the way to convince people they are safe on two wheels. Instead, planners must provide ample room, a kerb or other barrier so cars cannot encroach, as well as separation from pedestrians who might mistakingly cross into the bicycles. If the street does not contain this segregated infrastructure, a 30km/hr zone will prevent cars from barreling towards cyclists. A new idea catalog was just released last month called: "Idea Catalog for Traffic and Urban Environment in the North Quarter" and the proposals contained therein are recommended for inclusion in the City's budget. The total price for all suggestions would be 20 million Danish kroner or about 2.6 million Euro. 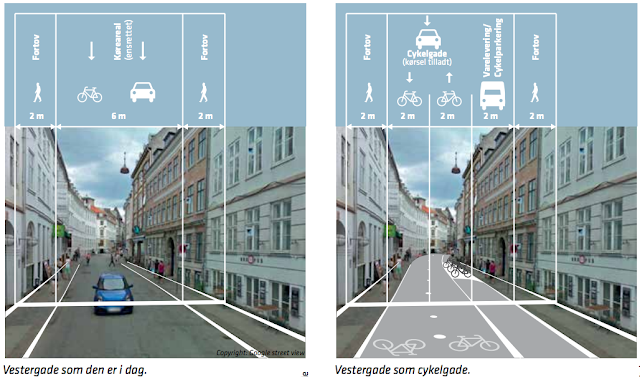 Among the recommendations is a stunning proposal to turn Vestergade into a bicycle street. Now, you may be asking yourself what makes this different from any other street in Copenhagen. Good point. The entire road will be turned into a bi-directional cycle path, with pedestrian paths on either end and flex parking for deliveries and bicycle parking. The street will remain a one direction street for cars, but their speed limit will be reduced to that of a bicycle's. Something that means bicycles are given the home team advantage. The document reads: "motoring allowed on bicycles' terms". Other road sections would be blocked for car traffic altogether, which is a wonderful improvement in roads that already are heavily bike dominated. Read the entire report here; although non-Danish speakers will have to use Google translate or find a Danish language-endowed friend. Screenshot from the Idea Catalog document. The street today (on left) and the street with the intended changes (on right). Could this be a third "missing link" in Copenhagen's bicycle network? We'll be keeping our eyes peeled to find out.